There’s nothing nicer than sitting outside in the evening with your friends and family, gathered around a warm, inviting fire. 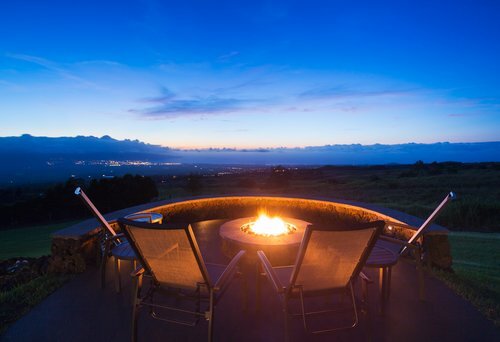 A fire pit is a great way to get the bonfire experience outside your own home. But if you have a vinyl deck, you need to be sure you use your fire pit safely. Here are our tips for using a fire pit when you have a vinyl deck. There are many types of fire pits available for you to purchase, but not all of them are suitable for use on a deck, whether it is vinyl or wood. You’ll need to choose the right fire pit to ensure you and your deck stay safe. Wood-burning fire pits are popular with many homeowners, but they aren’t the best choice for vinyl or wooden decks. Burning wood creates a strong flame, and the coals from a wood fire can easily reach temperatures of 1,500 degrees or above. Wood fires also throw sparks and embers, which can land on your deck and damage the finish or start a fire. Propane fire pits are an excellent alternative to wood. The flame is clean-burning and can be controlled with a knob or dial. Some propane fire pits even have hidden propane lines, allowing you to place the tank remotely. Natural gas fire pits are similar to propane, but are usually permanent installations with a dedicated natural gas line running from the house. If you know you want a fire pit and don’t mind not being able to move it, natural gas is a good option. Gel-burning fire pits are popular for small decks. Some gel-burning fire bowls are small enough to place on a tabletop, allowing you to make any picnic table or outdoor surface into a fire pit. The ethanol gel in these pits burns clean, and it doesn’t reach a very high temperature, but you must purchase refills from the store and it only lasts for a few hours. For most homeowners with vinyl decks, the best choice for an outdoor fire pit is a propane or natural gas fire pit. These fire pits don’t get as hot as wood-burning fires, don’t throw sparks, and don’t run out of fuel quickly (or ever if you use natural gas). However, they can still produce a warm and beautiful flame that is perfect for gathering around. If a wood-burning fire pit is the only option you’ll consider, you’ll need to compensate by upping your fire safety. Use the spark screen that came with your fire pit (or buy one if it didn’t come with one) and keep it on as much as possible. You should also buy a fire pit mat, which is a flame- and heat-resistant mat that goes under your fire pit to increase protection and safety. Alternatively, you can place concrete blocks or tiles where you want the fire pit to go. Along with choosing a fire pit that is safe for your deck, you’ll also want to put it in a safe place. Proper positioning for your fire pit can help you avoid accidents and leave you free to enjoy your fire. First, make sure your fire pit isn’t underneath anything, including umbrellas, awnings, shade structures, or tree branches. This might seem like common sense, but you’d be surprised how many fires each year are caused by inattentive placement of outdoor fires. Second, keep a distance of at least a few feet from any railings or walls. A strong wind can easily blow the heat from your fire pit sideways. Leaving a healthy buffer zone is the only way to be sure you won’t accidentally damage your deck or home. If you’re using a wood-burning fire pit, make sure you have enough space to position the fire pit in the center of the protective mat or tiled area. Embers can travel several feet, especially on a windy day, so don’t take any unnecessary chances. Finally, don’t sit too close to the fire, even if you’re only burning propane or natural gas. A sudden change in the wind or a simple trip or stumble could lead to a major accident. Back up and ensure you have enough room to move around comfortably. If you are considering installing or using a fire pit on your vinyl deck, make sure you’re also aware of any rules or regulations for your area. For instance, here in Dallas, your township or even neighborhood might have rules about fire placement that differ from what the state of Texas allows. Also, during hot and dry times of the year outdoor fires might be prohibited altogether. It’s also a good idea to keep safety equipment nearby just in case anything does go wrong. A fire extinguisher or a bucket of water or sand can help extinguish any unexpected fires – always keep them close at hand when using your fire pit. A fire pit is a great way to get outside and enjoy your vinyl deck from Future Outdoors. Our decks are built with the highest-quality vinyl in the industry, making them ideal for any kind of outdoor activity. Call us today at (972) 576-1600 to learn more about our vinyl deck options, or visit our Facebook page to follow us and get more updates and special offers!